That's my lunch. Or rather that my lunch-to-be for the next 2 months. 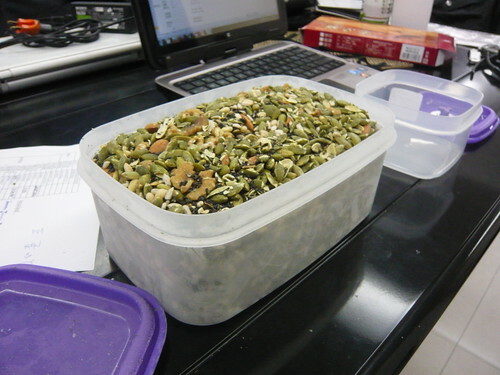 When I returned to Taobaoland, I packed a shitload of seeds and nuts with the idea of having a muesli-with-milk type of breakfast. After one try, I had to elevate this to lunch as just half a rice-bowl of this was extremely filling. I was so stuffed at breakfast that I skipped lunch and lasted till dinner without feeling hungry. Given that my office is very ulu, food is hard to access (unless you consider eating your way out of the warehouse) which makes lunch a problem everyday. With this, I not only able to eat healthy but I settle my lunch headache. Everything is unsalted with the exception of pumpkin seeds. That way, I don't overdose on salt while at the same time retain a bit of savoury. 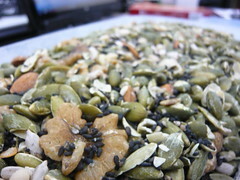 Good thing, I love nuts and seeds which means eating this for days on end doesn't faze me. I will still enjoy it. Besides, they'd make a great mid-day snack too. Thanks for the heads up but I should be ok on account of the fact that I don't eat a truckload of it at one go. Not really as the salt from the pumpkin seeds kinda help with the salivating. A bottle of water to go with it helps too. Deep in the belly of South China. Yes, I do concede the uncanny resemblance but I tell you, 5 or 6 spoonfuls of these and it's filling enough for me as breakfast to last all the way to lunch.